Techhousers and affiliates worked hard to put together over a hundred frames. 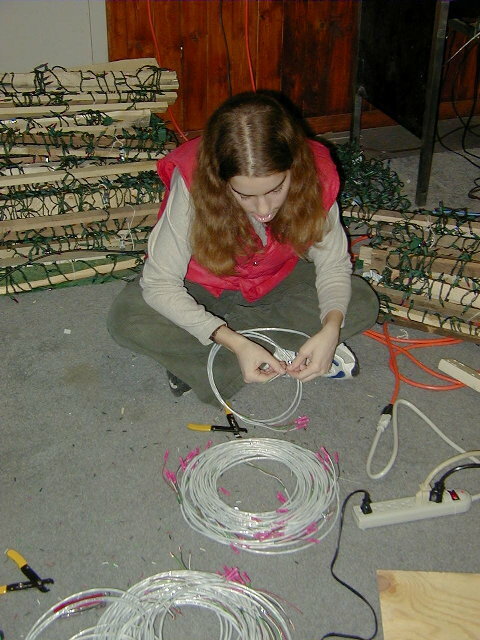 Rachel is stripping wires, note how she's surrounded by frames and wires. To insulate the relay contacts we "gooped" them with blacktop sealant. 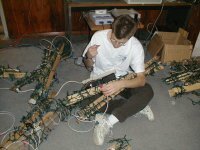 Dan finishes up a pair of christmas light frames. 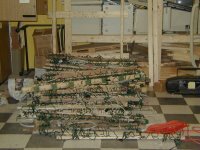 Here is a grand stack of light frames... and that's not all of them! 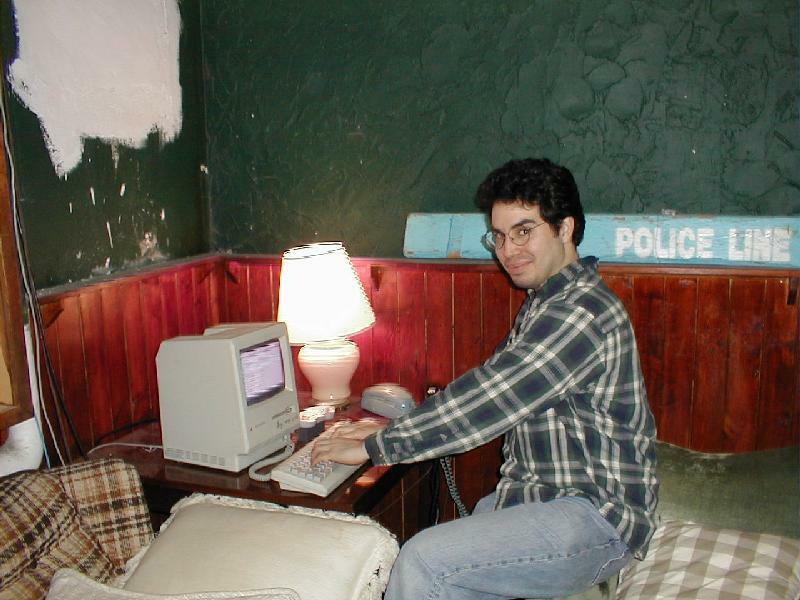 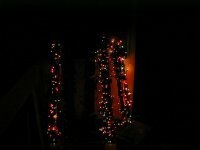 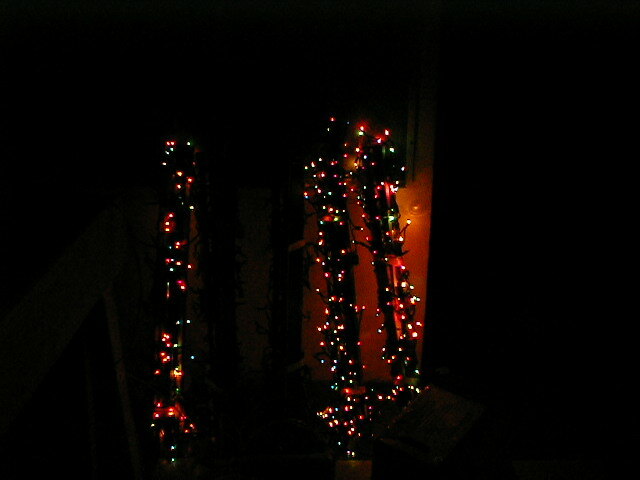 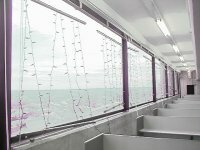 For the first time, we successfully control the lights via computer. 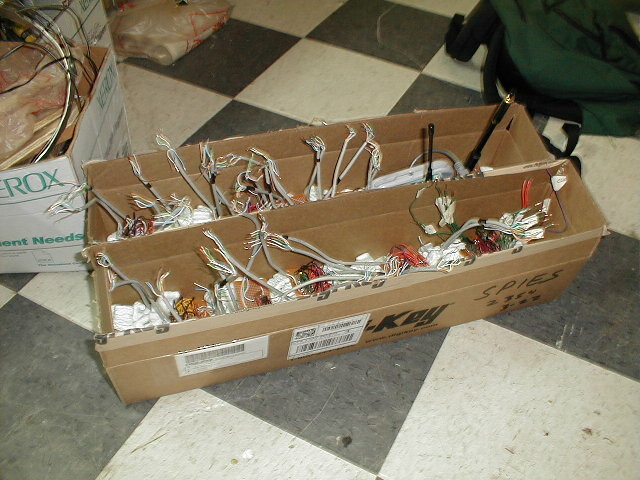 These are first-generation control boards, before being soldered. 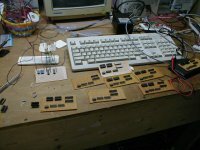 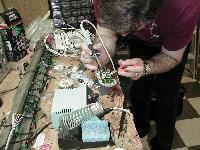 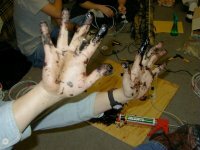 Brett, the master solderer, worked on dozens of control boards. 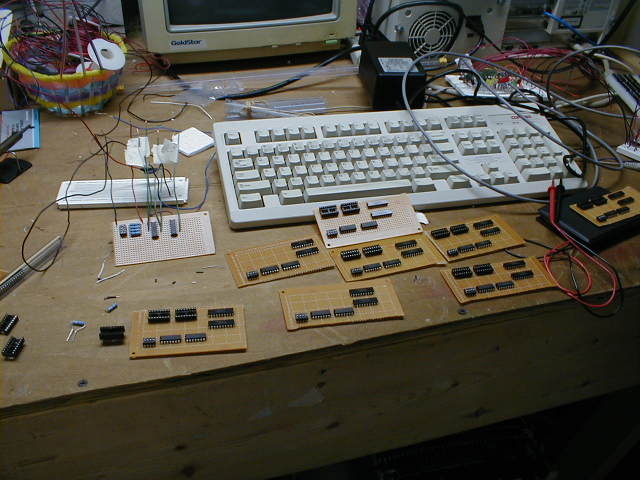 Here is a close-up of an early prototype floor controller in the makings. 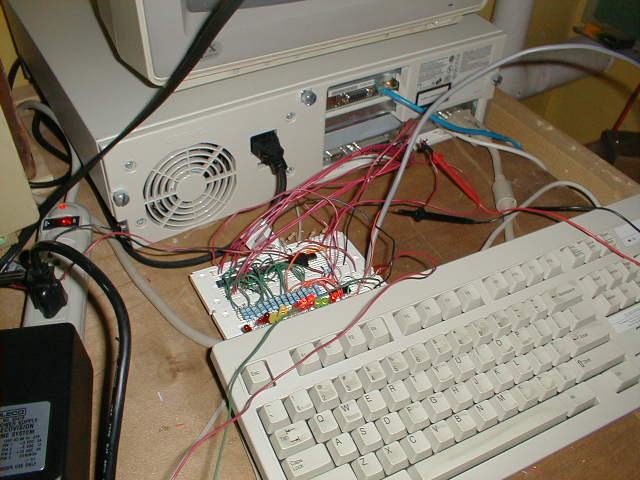 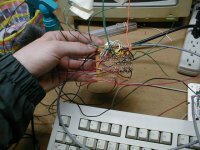 This was the test driver which linked the parallel port of a 486 to any floor controller we wanted to test. 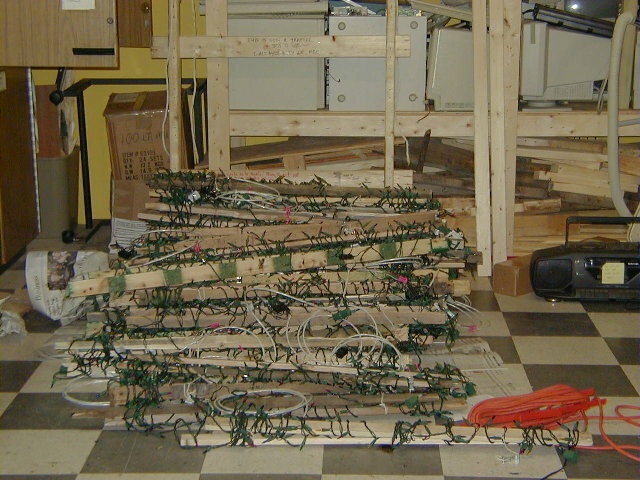 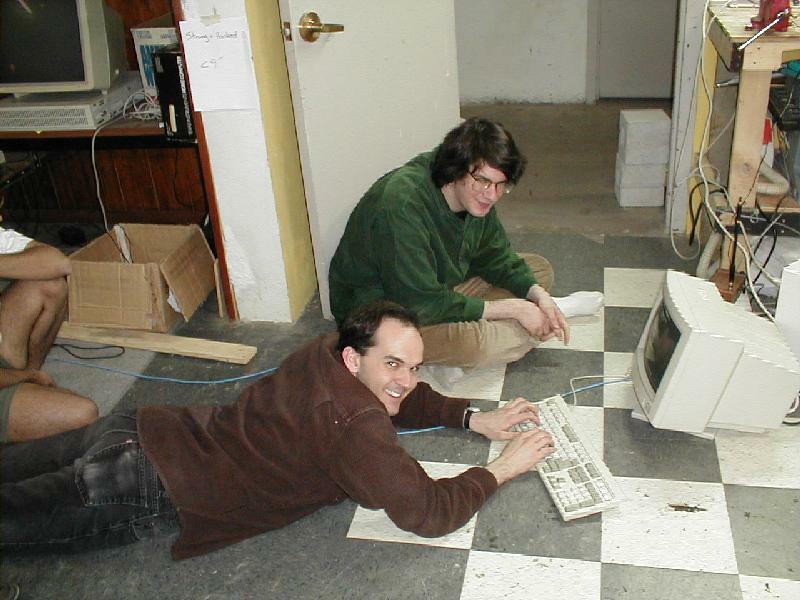 Behold the shrines in which we placed the finished and tested floor controllers. 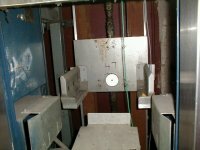 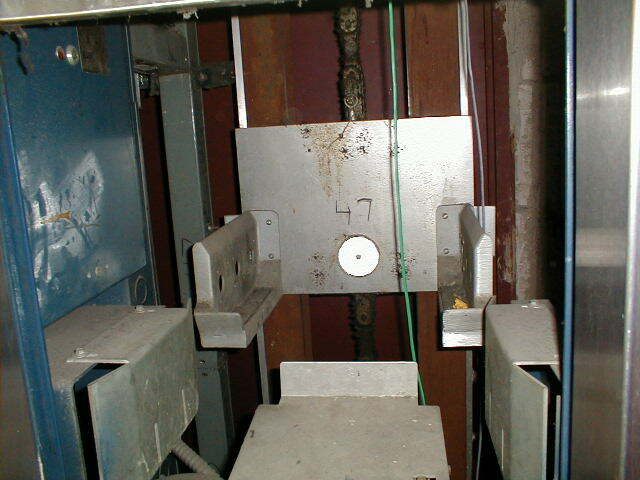 Vertical wiring was placed in the dumbwaiter shaft running between all of the floors. 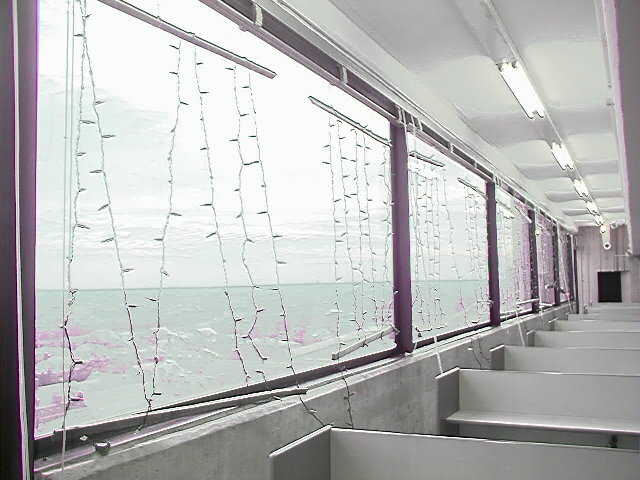 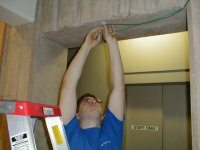 While installing vertical wires, we set up horizontal cables to control the relays on the light frames. 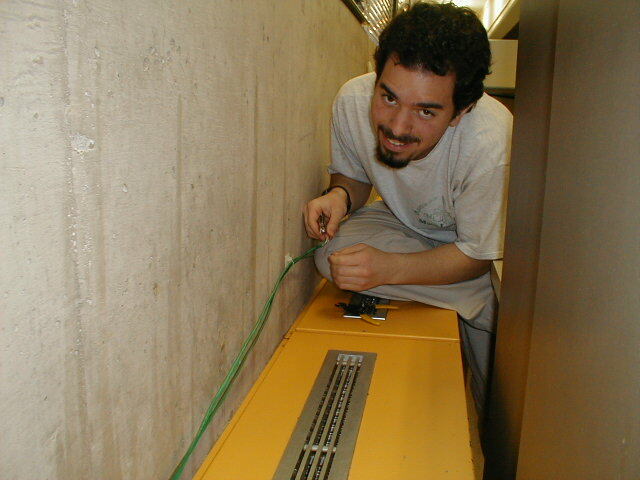 Mike strips wires after their installation. 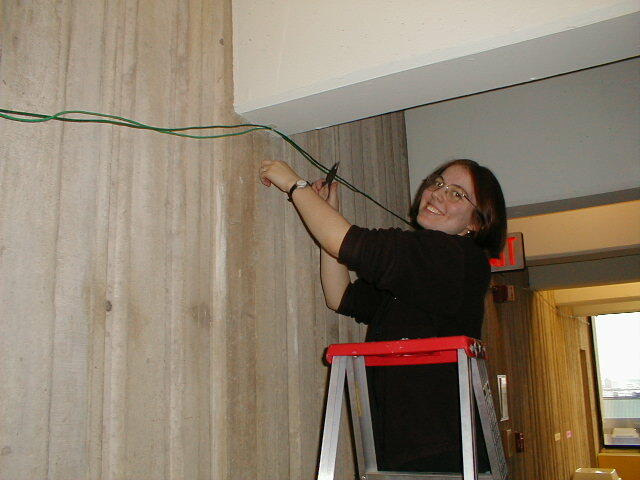 Reaching up high, Clara is tying up a wire to the corner next to the south wall of the library. Curran is placing "stickies" and tying the wire to them. 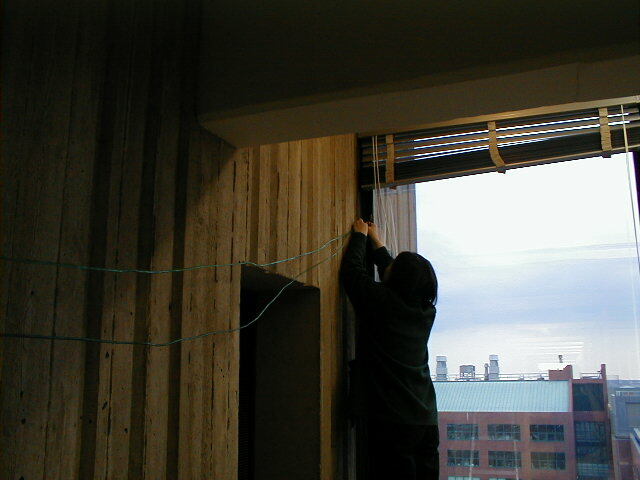 The frames seem to go on forever.... and they're on almost every floor! Rob Netzer created this incredible Nintendo controller for Tetris. 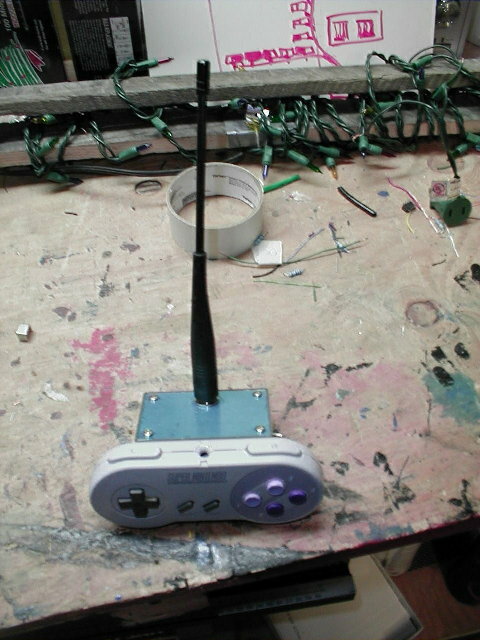 That is one awesome wireless controller. 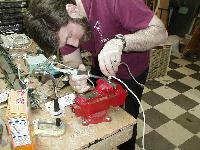 Rob Netzer, unofficial TH advisor, resolders his controller to make the "down" button work. 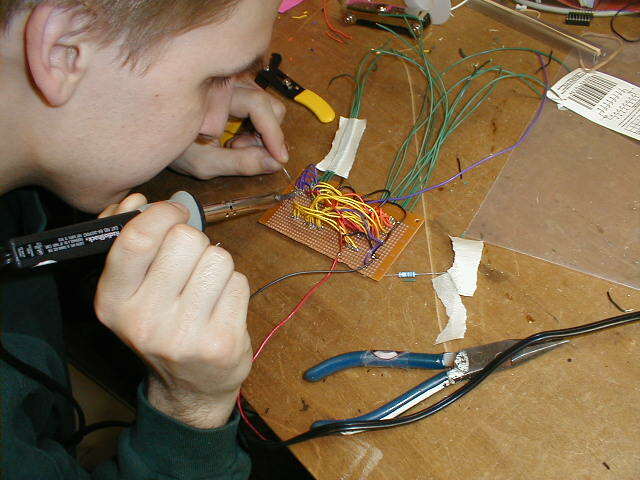 Rob solders a modular connector for the fortunately-never-needed third generation floor controllers. Keith hacks up "fuzzy logic" necessary to decode the controller's output. 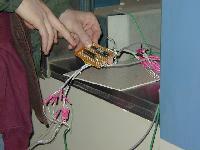 Soren and John integrate code written by Brett, John, and Keith to make a radio-controllable Tetris. 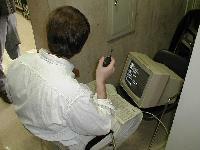 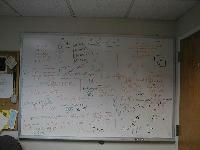 Ryan kept wrote ran tests and wrote lots of code during the week we were camped out in the SciLi. 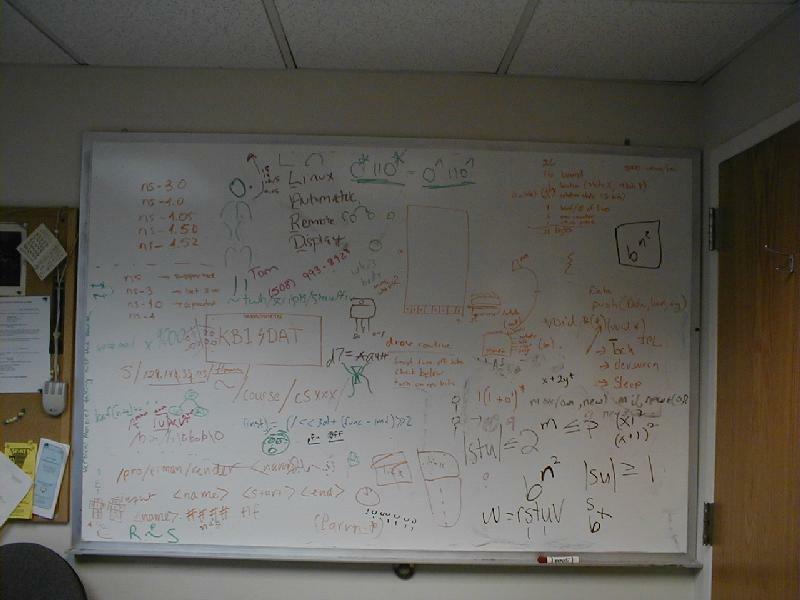 Early designs for Tetris patiently waited on Soren's never-erased office whiteboard. Controller boards like this were placed in the library's dumbwaiter shaft on each floor.